Hello, let me introduce myself to those who do not know me. My name is Ian Quance and I joined Edge last year having been involved in cemetery management at all levels for twenty years. I used Epitaph myself for many years to manage three busy cemeteries, this has given me an appreciation greater than just the software which is now a resource for you to draw on. Whilst I was lucky enough to work for relatively large authorities that gave me the opportunity and time to train for the job I had to do, I have always understood that the vast majority of people in my position are not so lucky. The average cemetery in England and Wales is small and only carries out a few interments a year. 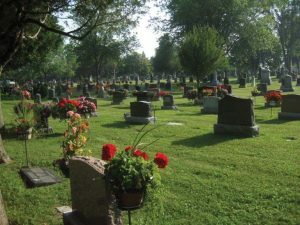 Those who have to manage them also have to carry out many other jobs at the same time and are often left worried that they are running the cemetery properly. In the information below, I hope to offer a few tips to make life easier and help you get the best out of your Epitaph. There is a certain amount of information that you are legally required to record for each burial: the burial register number; the date of burial; the name of the deceased in full; their age; their last address; the grave or vault number and the signature of person ‘directing or making entry’. The signature is an interesting one as most records are now kept on a computer. On the ‘grave’ page of Epitaph there is a small box ‘Person making entry’ which many people ignore. This is the box that provides the signature when you print out your statutory record and must be filled in, otherwise your statutory record is incomplete. For many years, I just put my initials in there, not realising its importance. If you work alone you can fill in your own name. If you are a manager, I would recommend checking all entries before they are numbered and entered into the register; be the gateway between ‘accepted’ and ‘checked’ applications. Your staff will then know that it is safe to number and finalise each booking. Whilst I’m on that subject, how you use the booking status is up to you but generally, best practice is to leave a booking as ‘provisional’ until you have all of the paperwork, ideally 72 hours before the interment, ‘accepted’ once you have the paperwork, ‘checked’ once the funeral is over and all possible details have been entered (see above), ‘numbered’ is automatic once you have entered the interment into the register. Return once more and ‘confirm’ the entry and it will disappear from your booking status list. These days we normally gather far more information about the deceased than we are required to by law. It is well worth reviewing your application form to ensure that the information can easily be transferred from paper to Epitaph. I’ve put an example of a complete application form here that you are free to adapt to your own needs. It contains an essential data protection statement. Information such as occupation may seem unnecessary but it’s an extra detail that genealogists will be keen to see in centuries to come. Use the ‘place of death’ drop down list to record places where death often occurs; hospitals, retirement homes, hospices and so on. If you include ‘home address’ as an option, you can fill in the details below without generating a huge list in the ‘place’ field. We’ve included an ‘actual depth’ field alongside the grave depth field; you may order a double grave but when it comes to reopening a grave, your gravedigger will want to know the exact depth to which they can safely dig. Grave-digging doesn’t always go to plan. Before back-filling starts, it is an easy task to measure the distance from the top of the coffin to the surface and record it here. In the next few months I’ll be looking at how all our clients are using the system; I’ll either email you directly if I see specific problems or report back here with more general issues. In the meantime, you can reach me via email – ian@edgeITsystems.com or info@egdeITsystems.com and by calling the office on 024 7666 7337.